The Sinflex® thread of light changes into exclusive accessories. This is the new project on which the Biellese enterprise, specialised in the production of lamé and highly creative fancy yarns, is now working. 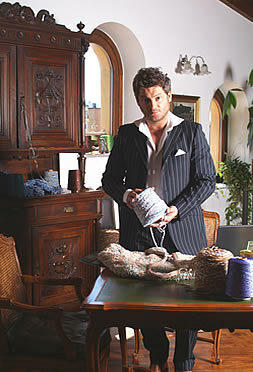 Lifeblood and heart of the company is Luca Lovero (sales manager) who has strongly believed in the work of the company and in the validity of the project, and has invested a lot in the development of this particular texile sector. “We have accessories for lady’s fashion created: alluring bags, handbags, hats, which met the consent and appreciation of our customers” he explains showing the new proposals by Sinflex®. Thick fancy yarns, which are given light by applying paillettes and lamé, are hand-processed to create extremely fanciful handbags. The exclusive fabrics realised with Sinflex® lamé and other various fibres change into accessories that can easily be matched with today needs and lifestyle. Thanks to the investments in creativity and innovation made in the recent years Sinflex® has been able to distinguish itself in times that are particularly difficult for the texile industry. “Our intention was to propose our customers a completely new lamé yarns collection – explains Lovero – by proposing over 400 colours: 188 of these have specifically developed for the weaving industry, while the others are ideal for the knitwear sector. We produce for a special niche that requires very special skills as very few other companies in Italy carry out the processes involved. We give our customers the possibility to choose the solution that is best in line with the current trends” continues the entrepreneur. “We do this by proposing innovative and different ideas. And it is precisely this exclusive relationship we have with our customers that distinguishes us from the rest”. The choice to develop “private collections” in collaboration with our clients represents the best solution to the demands of the spinning and weaving mills that use our Sinflex® product: unique, absolutely exclusive yarns for products that are to be noticed.